New E-book Just in Time for NPS! Last spring, Tatyana Brown took her Lit Slam brainchild to the 2013 Women of the World Poetry Slam, where the organizers graciously allowed her to poll the audiences at each bout: “Which did you think were the best-written poems of the festival, the poems you’d like to take home with you?” The result is Alight, an E-book of those poems. We are super-proud of this book. It contains stunning, emotionally powerful work from Lit Slam winners Sarah Kay and Sasha Banks, as well as from spoken-word luminaries such as Dominique Christina Ashaheed, Laura Lamb Brown-Lavoie, and Sierra DeMulder. We are personally and professionally delighted to publish an audience favorite by our own Carrie Rudzinski, who competed in the festival for the third time. 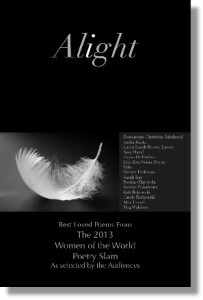 Alight is available for free during the 2013 National Poetry Slam, taking place this week out in Cambridge, Massachusetts. If you can be there, you should be there. If you can’t be there, download Alight today and keep a little poetry in your pocket this week. It’s available for Kindle, Nook/Kobo, and PDF formats.